By Air Berlin it’s about a 100 minute journey today from Gatwick to the German city of Nuremburg. Back in 1944 it took the Allied air force a little bit longer but when they left, an hour later, 90% of the city was smoking rubble. Today the only smoke is that from scores of beer kellers cooking the legendary Bratwurst. It swirls around the restored mediaeval streets and surges out of open windows, along with the sound of laughter and clinking glasses of beer. Nuremburg has not forgotten its unhappy past but it cheerfully looks to the future. A multicultural city that is proudly steeped in history, it welcomes visitors from across Europe, all keen to sample the uniquely German approach to life and beer. A high-speed metro, with magically no driver, whisks you from the airport to the city centre. Despite such technological marvels, Nürnberg, in the German spelling, is an ancient city. Located in the state of Bavaria, a part of Middle -Franconia, it dates back to the 11th Century. As the city expanded over time, the city walls were rebuilt further and further away from the castle so that their visible remains now fan out like ripples on a pond. On foot, the best way to explore the rebuilt centre, you can cross the bridges that pass over the Pegnitz river and the Rhine–Main–Danube Canal that pass through the city. Wherever you go, you’re always in sight of Nuremburg Castle’s Sinwell Tower, which itself offers stunning views across the city and of its historic churches and cathedrals that lance up into the sky. It’s a steep climb to the castle through cute cobbled streets and the ascent up the tower is even tougher, so if you don’t fancy the effort you can take in the sweeping views from the courtyard. Much of this area is still original and the restoration so well done that only a historian could tell the difference. With your breath back you can descend again, this time passing into Albrecht Duerer Square. Duerer was a genius – a painter, printmaker, mathematician, engraver, and theorist . Born in 1471 in Nurnberg he became the greatest artist of the Northern Renaissance but it is his picture of a Young Hare has bizarrely become one of his best-known works. Many of Duerer’s works hang in the Neues Museumn in Nuremburg, a stunning museum made from a centuries old convent melded with the latest in modern architecture. Wandering from room to room works up an appetite and a thirst so there’s only one thing to do – eat bratwurst and drink beer. 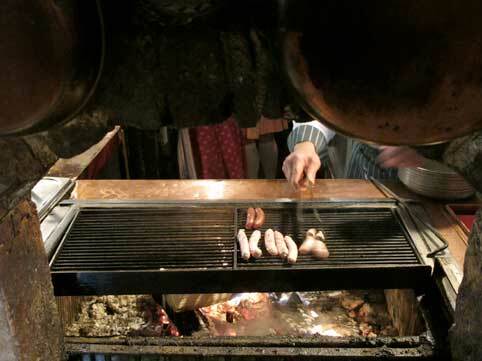 The best place to do both is Zum Guldenen Stern Bratwurstkueche, the oldest Bratwurst Restaurant in the world. ‘In business since 1419’ says the present owner proudly, while patting the fattest dog in the world slumped happily at his feet. The sausages, including the famously small Nurnberg Sausage, are cooked over a beechwood grill adding a marvellous smoky flavour to their marjoram infused porkiness. Traditionally served on a pewter plate they come with eye-watering horseradish, buttery potatoes and, of course, sauerkraut. Delicious when eaten on the restaurant’s sunny terrace or cuddled up inside during winter as snow piles against the ancient walls. And then there’s the beer to wash it all down. Made by the main town brewery, Tucher, in different styles, it’s low enough in alcohol to let you easily knock back a few chilled litres and still set off again after lunch. And with a full stomach and a cheerful heart, it’s time to see one of the main historical monuments of Nuremberg, the Palace of Justice where the post-war Nuremburg Trials took place. Here you can go into the very courtroom where the trial took place, a room of eerie memories. Twenty-four leading Nazis stood trial here led by the most important, Hermann Goering. In the impressive multi media museum also located in the palace you can see film of Goering welcoming his fellow defendants into the dock as if hosting a dinner party. That’s because he knew that he would eventually cheat justice by swallowing a concealed cyanide pill before punishment could be carried out. Such gloomy thoughts fly away back out in the daylight. Nuremburgers bear no grudges for what happened all those years ago, the young people are too busy getting on with life. The only past Nuremburg looks to is its ancient castle, its pretty centre and its historic beer houses and bratwurst. A weekend spent here is one where you can indulge in good walks, sightseeing, history, eating and drinking and still be comfortably back in the UK on Sunday evening, with perhaps a few bottles of fine beer stashed away in your baggage to be enjoyed on the Monday. that flatbread pizza photo is sharp! Nice.